Classes at Wits University were disrupted on the first day of the academic year. Members of the Wits SRC lead a protest on the Wits main campus in Braamfontein. Photo: Onke Ngcuka. 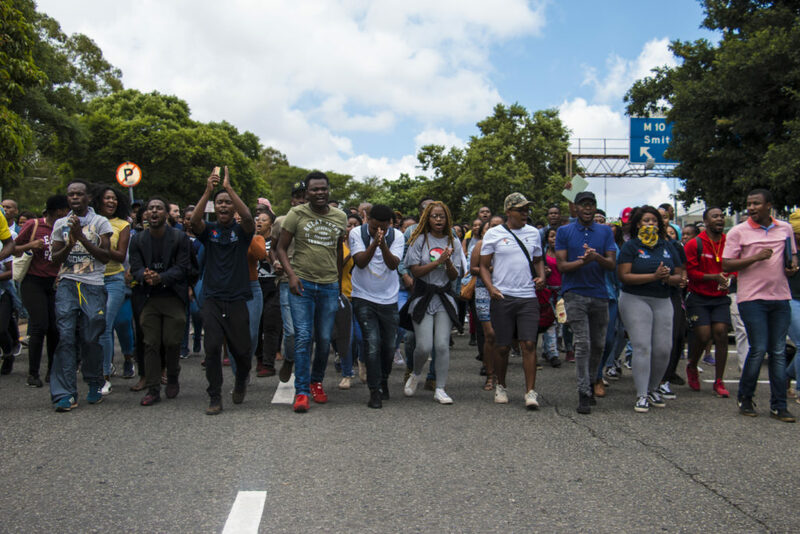 A GROUP of about 200 students, led by the Wits Student Representative Council (SRC), disrupted lectures on Monday morning, February 4, in an attempt to shut down the Wits main campus. The SRC said the protest was in response to a statement released by the university on Sunday, saying only students with debts of R10 000 and less would be allowed to register for 2019. “As per the Council-approved concessions for 2019 below, only students who owe the university R10 000 or less will be allowed to roll over their debt and to register this year. These students will also be required to sign an Acknowledgement of Debt form and make arrangements with the university to pay off the debt,” read the statement, signed by vice principal Andrew Crouch. It said the university could not afford “to allow student debt to accumulate as this will result in the university not remaining financially sustainable”. The statement contradicted what was agreed at a meeting held on Thursday, January 31, according to the SRC, which says the figure agreed to was R100 000. However, according to Crouch, agreements reached at Thursday’s meeting only applied to the Hardship Fund. The protesting students congregated inside Solomon Mahlangu House before storming lecture halls across East Campus. One lecturer, Nompumelelo Seme, showed solidarity with the protesting students who entered her property law lecture in Umthombo building, by adjourning her class. “I think that as property law students and law students in general, we should be concerned more about justice,” Seme told her class. “These are causes we cannot turn a blind eye to. I apologise to those of you who feel a sense of discomfort but these are real issues,” she added. The protesters then proceeded to West Campus where they clashed with private security and disrupted lectures at the Science Stadium before returning to Solomon Mahlangu to debrief. The SRC has vowed to continue with the protests until the university reverses its decision. “We’re saying that no students should be in class while other students are excluded and not registered, that’s why we are going around classes. No classes must happen until our demands are met,” Mbolekwa said.